Spring is all about new starts, new growth and color! YAY!! Spring is HERE!! 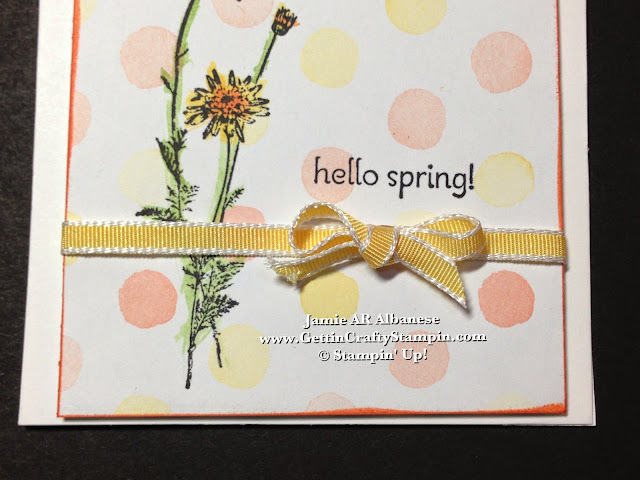 This mini hand-stamped 3" card is a sweet way to celebrate the start of color and sunshine, new growth and the buzzing of life anew. Don't Miss Out - Join Me at my Upcoming Spring Into Cards card-making class and RSVP ASAP , see how to take it for FREE and celebrate color and nature with me! Check out all the Spring and Nature Inspired craft supplies in the Occasions 'Let's Celebrate' mini catalog! Create a cute and easy card with a 3" card created from a sheet of 12" Whisper White card stock. I love that one sheet of 12" card stock will give you 8 cards (great for when you aren't using it to scrapbook). The Watercolor Wonder Designer Series Paper makes for a whimsical background with it's bright colors and soft feel. Stamp this Daisy, Bee and Hello, Spring sentiment from the Springtime Hello stamp set (both of these are in the Occasions 'Let's Celebrate' catalog). This Jet Black Stazon ink gives a sharp impression to these pretty stamps. Using the Aqua Painter in the Gumball Green In-Color (and soon to go away - so grab yours NOW) stamp pad and highlight the leaves and stem. This watercolor look to this bold line stamp softens the stamp while holding the image true. The Aqua Painter has a fine tip and can color great details like this. 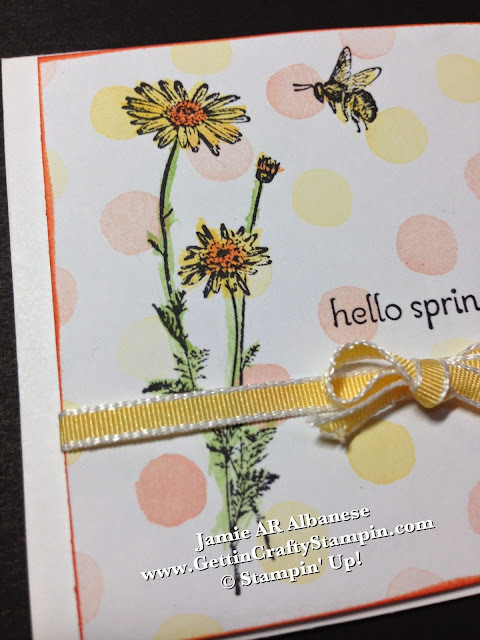 Color the bumble bee and daisy with Daffodil Delight ink from the stamp pad and then the centers with the Tangerine Tango stamp pad. This creates a color coordinated and festive Spring feel. I love our Taffeta Ribbon (really - all ribbon - much like paper I stock up, hoard and revel in it). Here the Daffodil Delight Taffeta Ribbon is sadly, retired!! Wrapping this tailored ribbon around the stamped and colored image is easy with our Glue Dots! They hold the ribbon to the back. I like to do a separate bow so that I can work it into the perfect shape. I then use another Glue Dot to adhere it to the front - this makes for perfect placement, too! A delicate card like this with it's pretty delicate images looks great with a fine ribbon like this - perfectly balancing the card. I am always bummed when these great products go away.. don't miss out on your favorite items. CLICK HERE to see the Clearance Rack and score some great deals on awesome crafting supplies and tools! Want MORE Savings?? CLICK HERE to see our Weekly Deals that change and offer up to 60% OFF our current products for a limited time!! Create a small layer when you tip the sides into the Tangerine Tango ink pad. This creates separation and richness with this 'imaginary' layer! Spring is all about New Growth - those first richly scented blossoms on the trees, plants that break through the ground to start a new life. Celebrate this wonderful season with this cute Springtime Hello stamp set and pretty Watercolor Wonder Designer Series Paper. I like to think the cute mini 3" hand-stamped card mimics the new small blossoms and growth of this season! 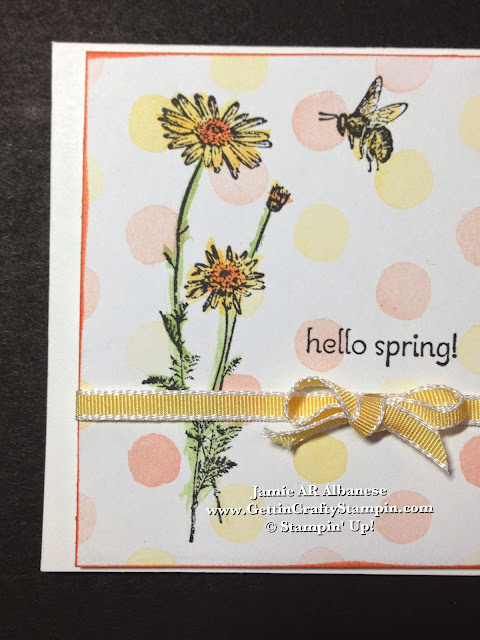 Celebrate Spring with me and the upcoming Spring into Cards class and create colorful nature inspired cards in nod to this new season!